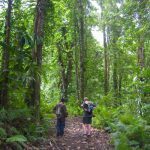 Kosrae is truly the undiscovered Micronesia, still unknown to the commercial world of general tourism. 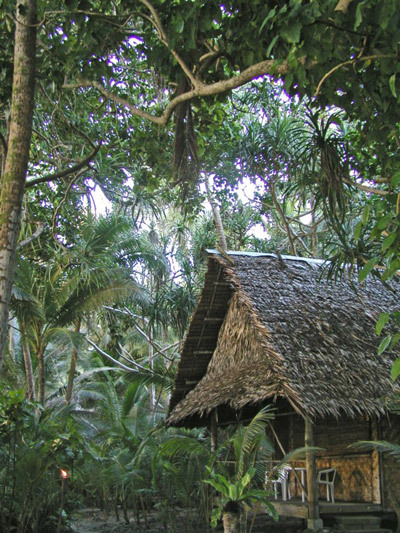 Kosrae is an unblemished island of peaceful villages and a traditional way of life in a remote setting of tropical beauty. This island supports a rural population of 7000 islanders who live a simple life and are devoutly religious. Kosrae is encircled by fringing coral reefs, all exceptionally healthy and remarkably diversified. 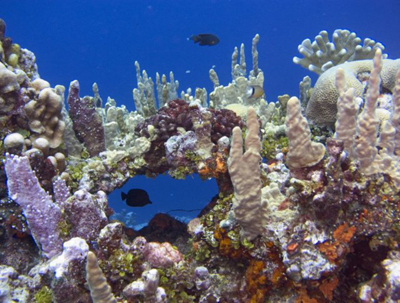 Researchers report seeing more than 170 species of stony coral and 10 species of soft coral. 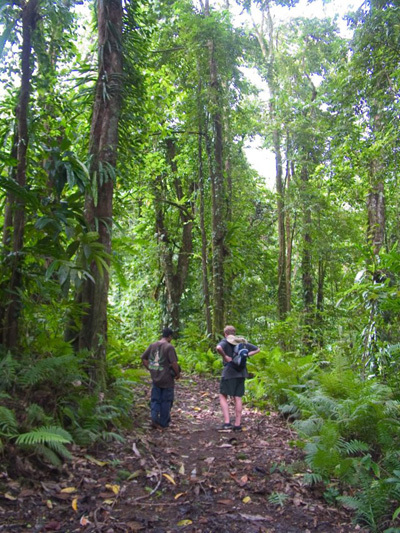 Kosrae is an exceptionally beautiful island, with a high mountain ridge that rises 2000 feet above sea level. Almost everything is closed on Sundays for religious services. 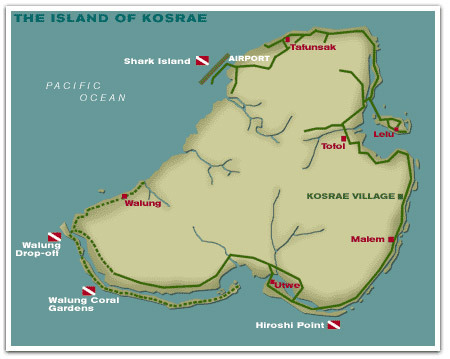 Dive map & descriptions provided by Kosrae Village. A great wall dive where the top of the reef sits at 40 to 70 feet. Potentially strong current on this dive makes this a dive for experienced divers, and may present challenges for underwater photographers. Common sightings include sharks, barracuda, eagle rays, napoleon wrasse, dog-tooth tunas, rainbow runners, turtles, as well as lots of tropical fish. This location is also home to many crinoids, lobsters and other invertebrates. A shear wall that often has fast currents. 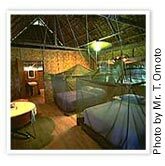 Resident schools of barracuda, large jacks and rainbow runners are often joined by spotted eagle rays, napoleon wrasse, turtles and other large pelagic animals. The reef top here is just as magical as at the Coral Gardens. Look carefully under the coral heads, you may be rewarded with the sight of very enormous, very shy puffer. You may also see huge barracuda or napoleon wrasse being groomed in cleaning stations. Steep sloping walls. Over the edge of the wall you can spot sharks and the other large ocean going creatures, but the magic on this dive is on the top of the reef at 40 – 60 feet. Marvelous collection of hard corals, tons of life: tropicals, shrimps, octopi… Little to no current makes this a great dive for photos. A good dive for novice divers. Easy beach entry makes this an excellent dive for all levels. 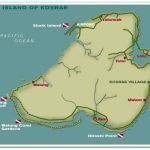 World class snorkeling spot as well as certification diving here. The top of the reef is covered with very large hard corals within 20 feet of the surface mixed with sandy patches. Large schools of big parrotfish, eagle rays, and many tropical fish. Also a great location for night dives. Macro Heaven. 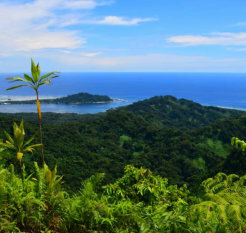 It’s hard to top Kosrae Village for a get-away that combines diverse world-class diving, a gorgeous underdeveloped island and a back-to-the-land eco resort. Kosrae Village Ecolodge & Dive Resort is surrounded by rainforest, mangroves and mountains, and the diving, based out of their 5-star Padi dive shop, takes you to stunning, pristine Micronesian coral reefs teeming with butterfly fish, sharks, barracuda, manta rays, clown fish, giant clams, and millions of fairy basslets. Nitrox and gear rental is available. Nondivers (or in between dives, you too) can snorkel, hike, climb, canoe and kayak, surf, bird watch, explore ruins, or fish. 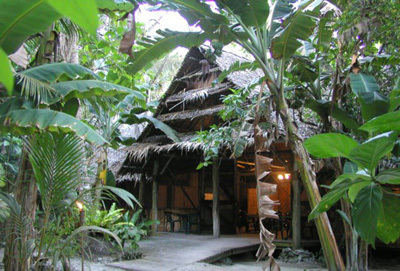 The spacious individual cottages are traditional Micronesian-style cottages situated under the shade of mangrove, pandanus and coconut trees at the ocean’s edge and connected by paths of naturally hard-packed sand. Strategically placed torches provide night lighting along the paths. The look is traditional, but modern amenities have been tastefully added: queen beds draped in mosquito netting, ceiling fans, hot and cold running water, in-room refrigerator and coffee pot. Dining at the resort’s open air Inum Restaurant has a reputation as some of the best in Micronesia. The food and bar are unrivaled. Proprietors Bruce, Katrina and Madison offer personalized service that includes computer access, photo downloading, and equipment help and can arrange all your topside activities, including traditional Kosraean massage in the privacy of your bungalow. 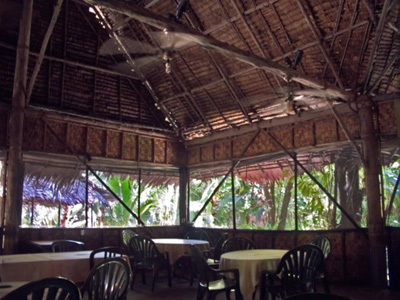 Kosrae Village also boasts the best restaurant and bar on the island…and many would say Inum Restaurant is among the best in Micronesia! Specializing in local and international cuisine, the menu changes nightly but almost always includes delicious dishes featuring fresh fish or crab. Snorkel – Many of the dive sites also set the stage for world-class snorkeling! 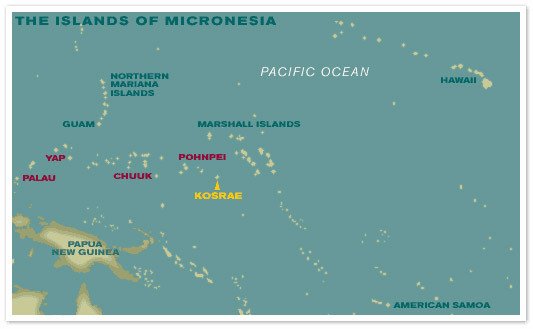 Kosrae is the second largest island and the most easterly state of the Federated States of Micronesia, located in the western Pacific Ocean. It lies about 3000 miles southwest of Hawaii, near the equator. How long are the flights to Kosrae? A flight from Los Angeles to Honolulu takes about 5 hours. From Honolulu, you’ll board the Continental Micronesia “Island Hopper”. Its route is Honolulu to Majuro in the Marshall Islands (5 hours), to Kwajalein in the Marshall Islands (1 hour), to Kosrae (1 hour), to Pohnpei (1 hour), to Truk (1 hour), to Guam (1.5 hours). So Honolulu to Kosrae requires 7 hours of flying time. Kosraean is the local language. English is commonly used and understood. Many individuals are also fluent in Japanese. Visitors may enter on a 30 day tourism visa if they have a passport valid for 120 days past the date of entry and a return or onward ticket. Kosrae uses standard 110 volt outlets (same as US). 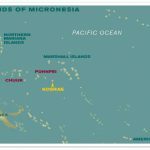 What airlines fly to Kosrae? 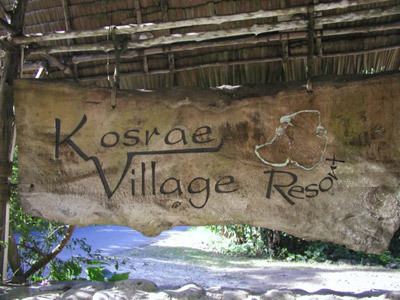 Yes, you will be met at the airport and transferred to Kosrae Village. Pristine hard corals, mild currents, walls, sharks, large pelagics, tropical fish galore, good macro life. Your diving days may start at different times depending on where you are going. You’ll depart after a leisurely breakfast and enjoy up to 3 dives a day including a sunset or night dive. Most dive sites are a 15-45 minute boat ride away. Kosrae is 17 hours ahead of Los Angeles and 14 hours ahead of New York.